1. Heat the oil in a frying pan and fry the spices from the curry kit for 1 minute. Add the onion and pepper, and fry for 4-5 minutes. Stir in the sauce from the kit with 75ml water, cover and simmer for 1-2 minutes. 2. Meanwhile, put the sea bream on a grill rack, skin side up. Place under a preheated grill for 3-4 minutes, or until just cooked. 3. Heat the rice according to pack instructions. Place the spinach in a large bowl, cover with clingfilm and microwave for 2 minutes, or until just wilted. 4. 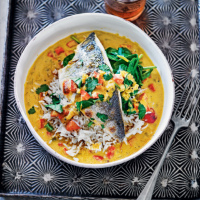 To serve, divide the rice between 2 plates, top with the spinach and spoon over the curry sauce. Place the sea bream on top and sprinkle with coriander. This recipe was first published in Thu Apr 27 09:25:00 BST 2017.